In the Fall of 2006, on a shopping trip for household items to the local dime store, my five year old son spied something that he wanted. "Mom can we buy this?" It was a small plastic bird feeder, on sale for fifty cents. "What do we need a bird feeder for?" I asked. He wanted it. For the price, I figured I could satisfy his request. So we bought the little blue roofed feeder and a bag of seed and brought it home to our apartment in the woods. I screwed in an "L" hook over the window frame outside, over the tiny garden bed that I had claimed beneath the window, filled the little feeder with seed and we watched and waited. Eventually, our first "customers" (the Tufted Titmouse) came and enjoyed the nourishment we provided. 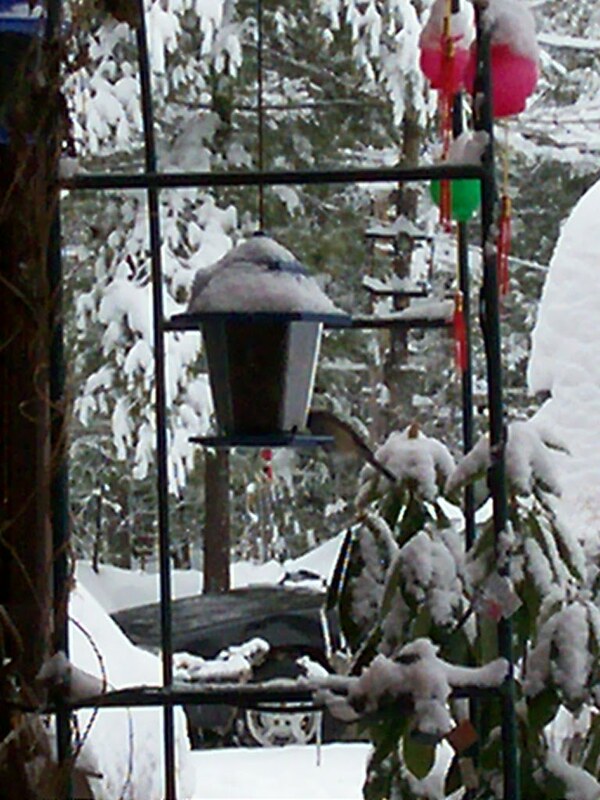 The following winter, we decided that we wanted to attract more "business", so I purchased another feeder of the same type- and we switched to all Black Oil Sunflower seed, which is what the birds from the previous year seemed to prefer. Before the chill of autumn had segwayed into winter, familiar looking birds were perching on the plastic trellis that arches over the edges of the window, first looking around, then looking up towards the sky- to the place where the feeder hung the previous year. I was certain that old friends had returned. It is my general rule that I do not hang my feeders until I am certain that the Bears have gone to bed for the winter, as it is a careless practice of humans to leave food out that will attract the Bears too close to human habitat. Mostly I believe that this is more perilous to the Bears, as humans have a tendency to blame the animal, who is simply following instinct, for any damage done. In the second year, with our new expanded restaurant, we saw more kinds of birds come to dine- our same faithful Tufted Titmice, Blackcapped Chickadees, Whitebreasted Nuthatches- and a few more, this time "ground-hoppers", large families of Dark Eyed Junco, and small groups of Tan Striped White Throated Sparrow. We were also introduced to the American Goldfinch who sat at the feeder, wearing their winter coat of muted browns and mottled yellows around their wings. I observed that the American Goldfinch, a funny little bird indeed, was quite different from their counterparts in that- instead of taking a seed, flying away to eat the seed, and returning for another and repeating the process- the Goldfinch would sit at the feeder and eat and eat, chasing away even the larger Titmouse by opening their beaks as if hissing at them, until they were satisfied. Then they would fly away. The Goldfinches came in large families, late in the morning, fussily casting unwanted seeds to the ground, which the Juncos and Sparrows happily ate up. After which, the rest of the "high birds" could happily carry on with their feeding. I wanted to see more Woodpeckers, though. 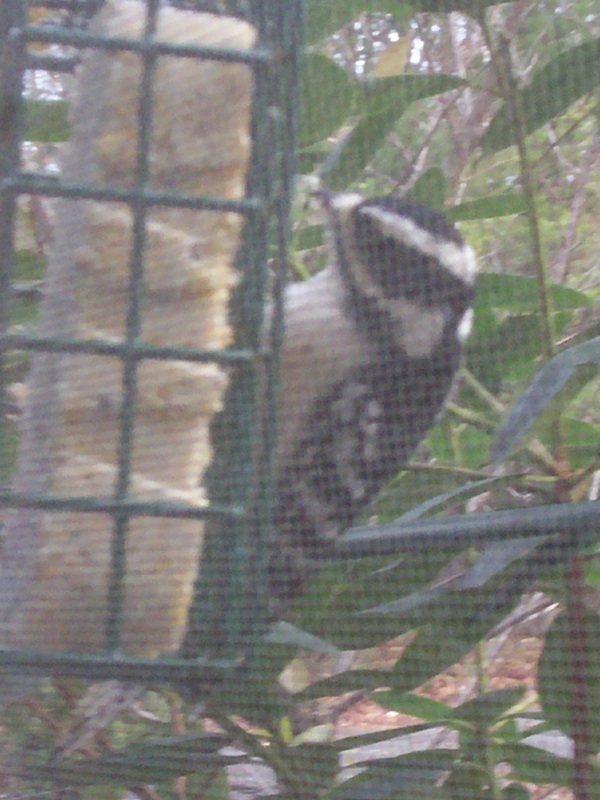 And after noticing how much the Woodpeckers enjoyed the suet cakes a friend had hanging outside his cabin, the following winter, I invested in a suet feeder. This was winter of 2008/09. And the Woodpeckers did come. First, the tiny Downy Woodpecker, males with their brilliant patch of red blotted in the middle of the smooth black stripes on the back of their heads, and the female. 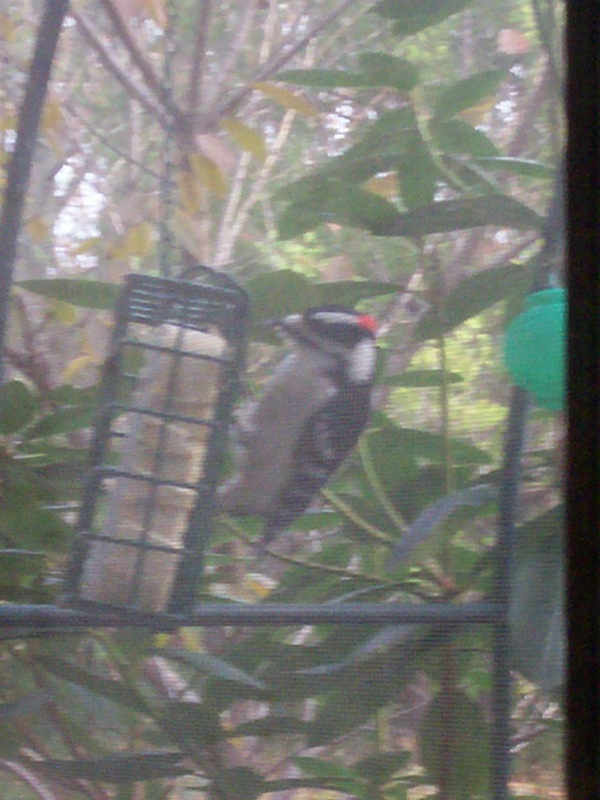 Soon followed the Hairy Woodpecker, similar looking to the downy, but larger in body and longer in beak. 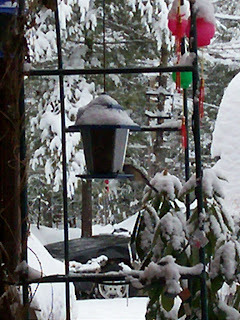 Our birds were one of the sweet delights that made me excited for the winter and sad to see the spring come, when it was time to put the feeders away and let "My Birds" forage on their own. The city life, though an interesting experience, was not for me. I enjoyed the Saguaro Cacti. How we marveled at how tall they were, as tall as our small apartment building in the woods. And I certainly could not believe my eyes at how large the Rosemary grew outside of the Tempe Public Library- it was as large as a bush! I had never seen one so big! But I looked all over the city for Birds. Searched the skies. Only on occasion did I see a few Common Grackles in the city- and one Red Tailed Hawk, forty miles outside the city on one of our hikes... How I missed My Birds! I'd left seed for them at home in hopes that the woman who visited to care for my cats would too fill the feeders for the birds. She said that she was not going to climb into the garden patch to be prickled by the bush there to feed some ol' birds! All in all, I have learned so much, and each year we make improvements to our feeding station. And I never fail to thank my son for that sweet and innocent request, four winters ago in the "dime store", a request full of so much Wisdom and Insight into our Beautiful Future. Thank You, Honey, again and again. The Birds Thank You, too.